...is absolutely anything that combines chocolate and peppermint - like these Sandwiched Mini Mrs. Salmi's Cookies with Peppermint Buttercream. That Buttercream Frosting is also great on Brownies, cakes, or in a big bowl and eaten with a spoon. 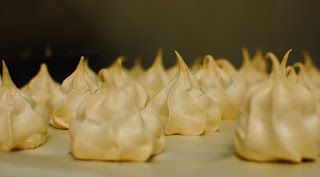 Or these Meringues that hide a peppermint bark Hershey kiss inside. For Christmas presents in college, a friend and I made white chocolate peppermint bark for our friends. I must have eaten 3 lbs. of the stuff myself. And yes, kids, you WILL get a stomachache from eating too much candy. 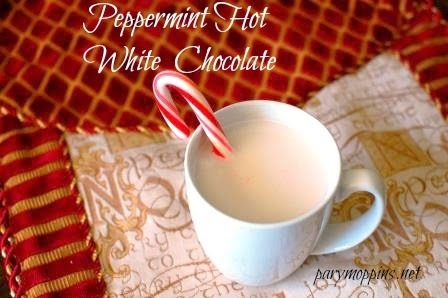 Chocolate/peppermint drinks are another favorite of mine like a Peppermint Mocha Latte or something I made this year Peppermint Hot White Chocolate. Process all ingredients in a food processor until well mixed. Heat milk on the stove and put several heaping teaspoons of mix in milk (to taste). Stir well until piping hot. Pour into mug and stir with the other candy cane. Enjoy! This is Day 20 of the Bloggy Moms Blog Dare. That almost made me leave my house (still in pajamas) to go get a food processor and white chocolate! Mm delicious..
http://busyhousebigheart.com/archives/344 << Here is my favourite holiday treat! Just get the white chocolate and bash it with a hammer - that will do the trick! What a great collection of favorite Christmas goodies! I have made your Persimmon Bread and it is delicious! Thank you so much for sharing with Full Plate Thursday and a very Merry Christmas to you and your family.